Is It “Deeply Offensive” to Enforce the Law? 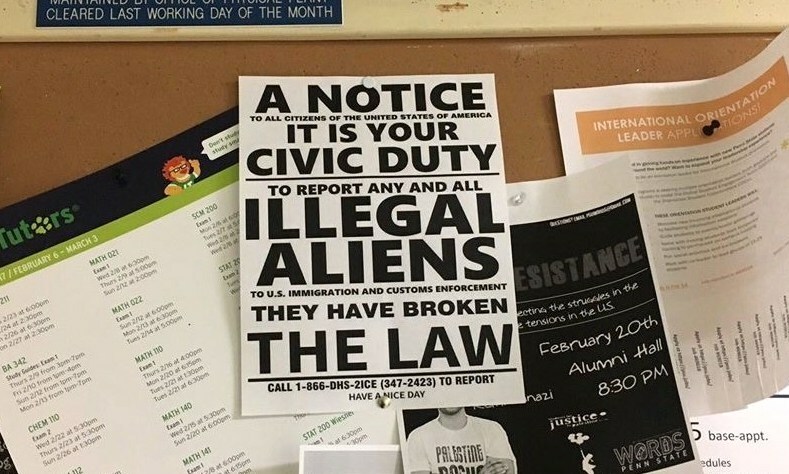 “The posters are unsigned and appear to be designed to provoke anger, fear and hate. The university finds them deeply offensive,” Penn State said in a statement. Is enforcing the law really a sign of “anger, fear and hate”? And why, exactly, is it offensive to suggest that citizens should cooperate in enforcing federal law? How did it happen that the American establishment became overwhelmingly, and enthusiastically, in favor of illegal immigration? Hmm. Is there anything in the poster about academic qualifications and hard work? Not that I noticed. Whether a student has a right to be at Penn State (or anywhere else in the U.S.) depends in part, of course, on our immigration laws. But the poster says nothing about country of origin. It is fine to have a “climate of inclusion for all,” but if “all” includes people who are present in the United States illegally, it shouldn’t come as a shock if they are caught and deported. Does Penn State’s administration mean to suggest that it deliberately harbors illegal aliens, thereby aiding and abetting violations of federal law? I think that is the clear implication. Does Penn State receive federal funding? We are living in a very bizarre era, in which large numbers of otherwise-respectable people consider it a point of moral superiority to commit, or aid in the commission of, federal crimes. This largely explains why Donald Trump is now our president.